The pusher beats you because he is doing something more important than hitting good strokes he keeps the ball in play. If you use the 80/20 rule in tennis you realize that getting the ball in play is one of the most important concerns and you can't win the point unless your shot is in or swung at by your opponent. One way to beat a pusher is to become better at pushing than the pusher is. So what is a pusher anyway and why are they so hard to beat for so many players out there. A pusher is a tennis player who constantly gets the ball back in play but doesn't really try to hit offensive shots. He or she is more content with letting you make unforced errors. Surprisingly it is very hard to beat a pusher. They may have the ugliest shots in the world but they can still beat many players. Why is that? It's because hitting great looking shots is not nearly as important as getting the shot in the court. Consistency is the building block of a solid tennis game. Apply the 80/20 rule to tennis. 80% of your results come from 20% of your efforts. In this case that 20% is simply getting the ball in play. Let your opponent have to create all the offense and all the unforced errors that tend to go with it. I am of the belief that you can beat 50% or more of all tennis players by being a good pusher. Most players just don't have the skill to keep the ball in play for more than 5 to 10 shots in a row. After that they feel too much pressure and end up hitting the ball out. I see this over and over again in my tennis lessons. It is actually rare for me to find students who can beat me when I play level one. Level one is where I or the student plays like a good pusher. The rule for level one is to not go for any winners. To hit the ball lightly and try to keep it deep in your opponents court. Therefore, even when you hit lightly you can make it hard for your opponent to attack you. I've even had 3.5 and 4.0 level students who couldn't beat me when I played level 1.5. Level 1.5 is the same as level 1 except that if your opponent rushes the net you can lob him and or pass him with a light shot. In other words you don't become a sitting duck by being forced to hit the ball back to the person at net. To beat a pusher you have to become proficient at level 2. In level 2 you now add the second most important element in tennis. That is placement. Power and spin are nice, but not nearly as effective or safe as good placement. At level 2 you still only hit up to about 60 to 70% of your power. At level 2 you still make very few unforced errors. When I play level 2 against someone who is playing level 1, the game ends very quickly. Whereas to win at level one takes very long points and lots of running, at level 2 I can end points in a matter of a few shots. Playing level 2 at a high level means that you can easily beat 75% of all tennis players. The funny thing is that you still aren't hitting the tennis ball hard. You have to learn good strategy as well as being able to aim the ball with ground strokes, approach shots, volleys and overheads to any part of the court. In level 2 you learn how to effectively use the whole tennis court. And you'll forever beat any pushers you come into contact with. If you want to win your tennis matches quickly and with less stress then you'll want to take some private tennis lessons with me. I'll show you how to hit winners with easy shots instead of low percentage shots. You'll do it by developing points, learning how to aim for the offensive target areas and by the clever use of strategy and time. I'm offering a sale for new students. You can take your first one-hour outdoor lesson with me at half the normal price. The sale price is $22.50 for the hour. 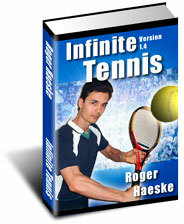 If you come for a second lesson I'll also give you my E-book Infinite Tennis: "Unlock and Unleash Your Hidden Potential to Play Your Best Tennis Ever" and my audio program 33 Techniques for Rocket-Like Serves. This is a $27 value and is guaranteed to improve your tennis game at least a half point on the NTRP ratings scale. To find out more about my lessons just visit this page.